The idea of the Scottish Highlands has been an important source of inspiration for many composers, especially in the first half of the nineteenth century. The best known examples are probably Felix Mendelssohn-Bartholdy’s overture The Hebri­des (or Fingal’s Cave) and his ‘Scottish’ symphony. The young Niels W. Gade – perhaps with Mendelssohn as his direct model – himself wrote his way into the same tradition with his breakthrough work Echoes of Ossian op. 1 (1840-1841) and the concert overture In the Highlands (1844). A common point of departure for many of the time’s ‘Scottish’ compositions was the poems that James Macpherson published in 1760 and the next few years, and which he claimed could be traced directly back to the Celtic bard Ossian, son of the legendary King Fingal. Gade’s so-called ‘dramatic poem’ Comala op. 12 is such an Ossianic composition, based on Macpherson’s poem of the same name. It is the tale of King Fingal of Morven, who goes to war against the King of Lochlin, Caracul. His beloved, Comala, remains behind and she fears for Fingal’s life. Her maidens try to reassure her, but the sight of the spirits of her ancestors going off to the battlefield to fetch the souls of the fallen convinces her that Fingal is one of the dead, and she dies of grief. She is wrong. Fingal returns victorious but finds his beloved dead. Gade’s Comala can be described as a secular cantata for vocal soloists, choir and orchestra. It begins with an instrumental introduction, followed by twelve vocal movements which alternate between solo sections and choruses. The slow introduc­tory movement is dark in tone and borrows motivic material from Echoes of Ossian. Both are in fact in A minor, and it has been claimed – also in its own time – that it had actually been Gade’s plan to use Echoes of Ossian as an overture to Comala. There are unfortunately no letters or other material from Gade to confirm this. The choral movements, which contrast with the more lyrical passages, are relatively simple, but effective: we hear the warriors going off to battle, the spirits of the ancestors who ride on the storm to fetch the souls of the dead, the returning warriors, and finally the mighty final chorus in honour of Comala. About halfway through the work, Comala’s handmaiden Dersagrena sings a ballad to harp accom­paniment of the deeds of King Fingal – an example of the folk-music-like elements that Gade sometimes used in his works, and which we also know for example from The Elf-King’s Daughter. At the same time the ballad reminds us that the Ossian poems originate in the idea of the bardic tradition of the past. In between these movements are the solo sections: Fingal taking leave of his beloved, Comala, who confides her fears to her handmaids; the death of Comala, and the lament of the returned Fingal. Gade wrote Comala in the winter of 1845-1846, while he was staying in Leipzig. He knew the Ossian poems from Steen Steensen Blicher’s Danish trans­lation, but for the planned choral work he had one of his acquaintances in Leipzig, Julius Klengel, write a German libretto. Klengel chose to change the story slightly from Macpherson’s version. In the original poem it is the jealous Hidallan who deliberately brings Comala the false news of Fingal’s death. In Klengel’s version Hidallan does not appear; it is Comala’s own imagination that convinces her of the death of her beloved. The story is thus somewhat simplified but also loses some of its drama; or rather the drama is transferred from external action to an internal struggle. Gade himself conducted the first performance at the Gewandhaus in Leipzig on 23 March 1846. He wrote rather euphorically home to his parents in Copenhagen that the performance had been such a great success that it was repeated in a sub­scrip­tion concert at the same place just three days later. According to Robert Schu­mann’s diary, Mendelssohn described Comala as melodious with beautiful features, but typified by a certain immaturity: enthusiasm alone will not do, as he is said to have put it. Schumann on the other hand was entirely enthusiastic. Although in gene­ral the press in Leipzig also spoke of the work in laudatory terms, in 1848 Schumann wrote to Franz Brendel, the publisher of the periodical Neue Zeitschrift für Musik in Leipzig, that the Leipzig audiences in his view had not appreciated the piece enough. Schumann regarded it as nothing less than the “most significant of recent times”, and “the only one that deserves to be crowned with laurels once again”. Indeed Schumann himself also conducted Comala on several occasions. In other parts of the German press the criticism was harsher. The music was regularly criticized for being somewhat monotonous, and the text for a lack of drama. Its character was often described in relatively neutral terms as ‘Nordic’, but sometimes also more negatively as misty, heavy or quite simply boring. Neverthe­less Comala was to be one of Gade’s greatest successes. In Germany alone the work was performed over 80 times during Gade’s lifetime. And in among other countries the USA, Britain, Holland and Russia it was also performed repeatedly. Incidentally it was Comala that prompted the writer Louise Otto to recommend that a new German national opera based on the Nibelungen material – which she had advo­ca­ted in several articles in Neue Zeitschrift für Musik – should be set to music by precisely Gade. In a letter to the literary figure Friedrich Theodor Vischer she writes that the composers in Leipzig – including Schumann, Mendelssohn and Gade – were approaching it on tenterhooks, and adds: “I was quite afraid, for I was convinced that neither of the two first-mentioned would be able to create such music, and I was beginning to regret the whole idea – and then Niels Gade [...] became ever more fired up by the idea. But, aware of the scale of the task, he first composed as a trial a concert-/symphony cantata ‘Comala’ after Ossian [...]. It has been per­formed twice in March in Leipzig to thunderous applause from the audience, and to the astonishment of the composers, who admit that ‘we would not really have believed it of him’ – so now we have the most important thing: the composer. At any rate all those whose evaluation of the case means anything assure me: he – or no one – is the man for the Nibelungen.” In fact Gade went to work on the composition of the opera in question – Siegfried und Brunhilde – based on Louise Otto’s libretto at the beginning of 1847, but got no further than a sketch of sections of the first act. Back home in Denmark, Gade conducted Comala at the symphonic society Musik­foreningen in Copenhagen on several occasions. The first performance was on 17 December 1850. It does not seem to have left any significant traces in the Danish press, and after another two performances – in January 1851 and March 1856 – Comala had to remain in a drawer for many years. One of the main reasons for this was the increasingly strained relationship with the German language after the Schles­­wig wars of 1848-51 and 1864. 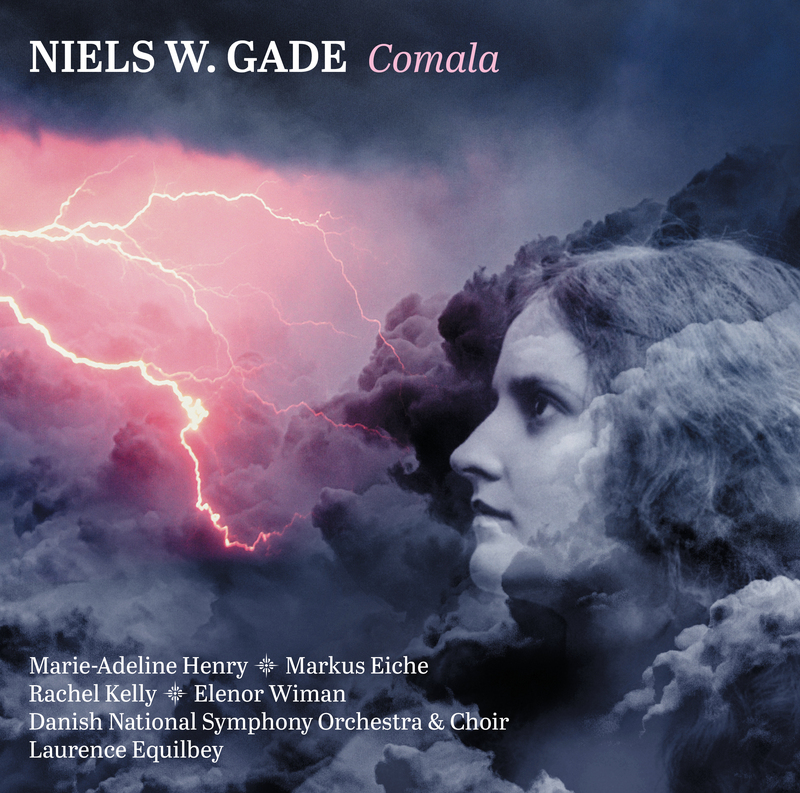 When Comala was staged again in Copen­hagen in 1871, it was done for the first time with a Danish text, probably translated by Carl Andersen, who in those very years wrote texts for a number of Gade’s major vocal works. Nordisk Tidsskrift for Musik wrote in its review of the concert in March 1871: “Like a couple of his other earliest works, ‘Comala’ was originally written to a German text, and in this form the musical work has earlier been performed here; but here too we must seek the reason it has remained unperformed for so many years. For immediately after the war years in 1848-50 great antipathy was expressed towards hearing the music of such a national composer underlying a German text, and a Danish reworking presented not a few difficulties. Finally, though, it has been possible to produce such a translation, and this marvellous work has thus once more been taken forth and has now become the full property of the present age and posterity.” Thus, even if the German text is thought to conflict with the image of Gade as a national composer – as people wished to see him at that time – there can today be little doubt that the Danish translation is far poorer than the original German text, and that the work is essentially in the German language. Gade conducted Comala in the Danish translation in two more concerts at Musikforeningen in December 1887, and the success of the work was thus far more modest in Denmark than abroad. That Comala must nevertheless be counted among Gade’s most important works, also viewed with Danish eyes, is confirmed not least by the fact that it was Comala that was on the programme when the music societies Cæcilieforeningen, Koncertforeningen and Studenter-Sangforeningen joined forces to hold a memorial concert in honour of Gade on 21 February 1891 – precisely two months after the composer’s death. After this, Comala seems gradually to have been more or less forgotten or overshadowed by other compositions. However, it was dusted off and performed – in Danish – in a DR Thursday Concert on 2 February 1967 at the Broadcasting House Concert Hall in Copenhagen on the occasion of the 150th anniversary of Gade’s birth. His bicentenary thus also seem to be an appropriate occasion for reviving the work – now in the original German version, which was the one known and appreciated internationally in Gade’s own time.